The Thirty Nine Steps has been said to herald the birth of the modern thriller; Toby Buchan, the grandson of John Buchan, the author of the novel, explored this idea at the Festival on Saturday. The Thirty Nine Steps, one of the best known adventure novels, has never been out of print. It first appeared as a serial in Blackwood’s Magazine in August and September 1915. It was published in book form in October that year. It was the first of five novels featuring Richard Hannay, an all-action hero with a stiff upper lip and a miraculous knack for getting himself out of sticky situations. The novel formed the basis for a number of film adaptations, notably: Alfred Hitchcock‘s 1935 version. The comedy stage adaptation of the novel has been keeping audiences amused across the UK for several years. Toby Buchan is the grandson of John Buchan, the author. 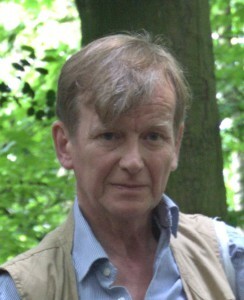 Toby succeeded his father (John Buchan’s third child and second son), as fourth Lord Tweedsmuir in 2008, a title first held by his grandfather. Toby is Editorial Director of John Blake Publishing and, inevitably, Honorary President of the John Buchan Society. Interestingly, one of the biographies written by Andrew Lownie, a speaker at Lavenham on Festival Sunday is about life of John Buchan.